Sendai has a population of over one million and is the economic, political, cultural and commerce center of the Tohoku region of Japan. It can be reached from Tokyo in about two hours by bullet train. 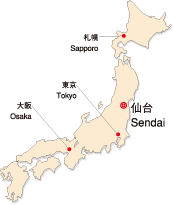 Sendai International Airport has regular flights to and from Seoul,Beijing, Shanghai, Taipei and Guam. Sendai is a town rich in cultural institutions such as museums and libraries. Sendai is also a city of learning, where more than two thousand international students are studying at universities (including Tohoku University), junior colleges and specialized training colleges. The number is increasing every year because Sendai is a comfortable city both for living and for studying. There are a lot of scenic spots near Sendai, such as the Matsushima Islands (one of Japans’s Top Three Views) and the Zao Mountain Range. Sendai is an international and modern city with natural beauty and a mild climate. Copyright (C) 2004-2019 Tohoku Gaigo Al lrights reserved.